The guide discusses the attributes of good residential solar systems, different methods of system ownership or finance, and key questions to ask BEFORE signing a contract. Many of the topics addressed in this document are based on frequently asked questions regarding solar submitted to the MEA, the State of Maryland’s energy office. 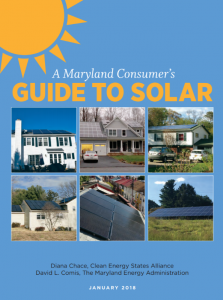 This solar guidebook also discusses Community Solar, a new pilot program in Maryland that provides solar options for those who rent, as well as for those households who may not have good solar access due to shadowing from trees or other buildings. Click here to download the full guide.